Had anyone ever based a horror story on a shape before? Junji Ito did, and he did it terrifyingly well. The Japanese Uzumaki translates as spiral (or vortex). The shape of the spiral has cursed the small coastal town that's the setting in this masterpiece of madness. 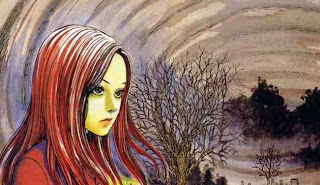 Junji Ito is a very recent discovery for me. I hadn't read any horror manga until I stumbled across Ito's "Museum of Terror". I was sold! The evolution of manga has always been of interest to me. There has never been a Comic Book Authority Code in Japan. 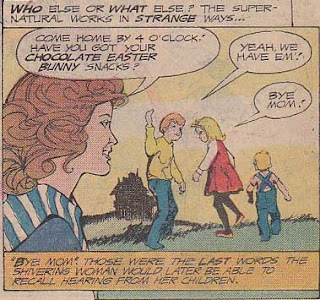 There have been comics aimed at mature audiences for some time. I've read a lot of Western horror comics. The twist ending with its dark karmic justice formula is embedded into my brain. EC was famous for this 'big payoff' ending. It works in comics. There is no big payoff in Uzumaki. There is only survival from the all-consuming vortex and a twisted study of humanity. I have Chapter 7 'Jack-In-The-Box' in SUBMISSIONS. This chapter is a good primer for the rest of the story. The entire series is easily found online but as always I implore you to support the medium by buying the graphic novels. 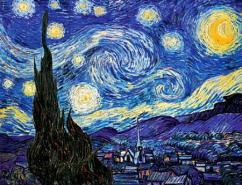 I wonder if Mr. Ito was inspired by Van Gogh's "The Starry Night"? The one you read as a kid.